This is the discussion related to the wiki page	SCP-098. Why is this and SCP? it has no unusual or supernatural abilities, it's just a mildly dangerous animal. there is no reason for the Foundation to care about this any more then they care about grizzly bears. How is it now, Norms? I think the changes are an improvement, makes them seem more… outside the realm of everyday experiance, as well as more threatening. Looking back at the first version, I get the impression that you were trying for something that could really exist, and I think the new version still has that quality, so youe're still succeeding in that regard. This isn't the only strange animal SCP. Are you talking about that flying deer? Nope, haven't even read that one yet. Honestly, it just sounds like a pack of sea wolves. Is not Keter but nobody knows if a item will be reclassified. Anyway, I would suggest that the line "They also have a remarkable range of vocalizations." be moved down a couple paragraphs to the section discussing their vocal communication. It feels quite out of place tacked onto the end of a description of their habitat. I thoguht that images had to be spoilered. Is it okay to use a signature? Quite possibly, the rules may have been a bit more lax 5-ish years ago - when that post was made. My god… They're like tiny predatory hatbots. This seems like a creature that could very likely be on earth. Nothing really ABNORMAL about it, in my opinion. There are plenty of creatures on earth more dangerous than this one and the Foundation doesn't take those in. I've edited this old article for tone and content. you should add some other threatening to this SCP features, like incredibly high breed rate , high speed movement in short distances or even the ability of mimic the envivorement ( like a chameleon), or anything else to making them more dangerous than an animal kingdom curiosity. Dr. Mann has taught several of them simple tricks, and they seem to understand the meanings of several commands. Testing will continue. You should consider adding a file concerning this, just to make the info about the SCP more complete about it's capabilities. Better yet, let's make them radioactive! That's really dangerous, right? It's bound to make them more scary! haha, what I mean is that they should really have something to make more like a threat, the only real shocking part is they keep their preys alive for hours while devoring them and the fact they can adapt easily to their environment and learn patterns, but they are nothing that average population couldn't handle, just like "shut doors and windows at night, if you see one call for help and be sure to kill them all" I really have seen more dangerous things around where I live, I bet this SCP could be even smashed with a rock, that's why the idea of giving them a high breed rate could be a good adding and they would be more like "if we leave them alone things could get pretty nasty since they can bred very fast and also adapt easily to be more efficient hunters"
I agree with this article needing something extra. There doesn't seem to be a real reason the Foundation would have this. It seems more a job for animal control. I think it would be better if there was something the Foundation was interested in about the viscous mucus that these crabs spit out. Also more description about their knife hands would be interesting. Even just a transcript of what the crabs say to foundation members during feeding could liven this up a bit. 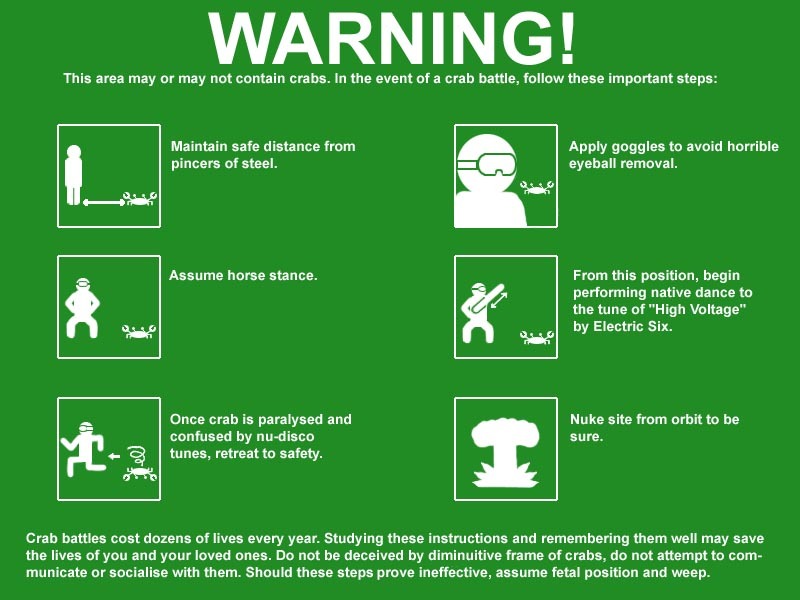 These sure are some nasty crabs, but I don't really understand why they are the Foundation's concern. Am I missing something here? Pretty much sums it up. I can't really see them pose any threat to normalcy. They can talk. They're half again as big as the largest possible land arthropod. They employ a hunting strategy that's unlike any other creature on Earth. They're much smarter than a crustacean has any right to be (and if you'll notice, when they were first captured, the Foundation suspected they were even smarter). None of this makes sense if they evolved naturally. The only reason this isn't pointed out in the article is that it shouldn't need to be. It should be pretty obvious these things can't be naturally-occurring creatures. I mean, yes, obviously some people are having trouble getting it. But since it's at +62, I have to imagine most readers understand these points without needing to be told.